Miles Davis has referred to trumpeter Mack Gollehon as “Mister Chops”, a fitting sobriquet for the versatile trumpeter who’s lent his skills to the work of David Bowie, Duran Duran and Blondie and a broad range of others, a man in command of his instrument, an agile, fleet improviser who finds the groove, expands it, makes it memorable.The ever searching Gollehon has commenced into the rich and rhythmically propulsive music of Latin EDM and House Music on is new release Mac Gollehon and the Hispanic Mechanics. Bright, blaring, buoyant, emotionally cathartic, ensemble establishes a stellar set of cross currents in what seems as astonishingly rapid conversations , calls and responses, points and counter points of percussion, piano, horns and a steadfast chorus of singers chiming through the dancing propulsive.Gollehon is a master of tone alternating between sounds reminiscent of the muted grace of Miles, the fat and scalar runs of Freddie Hubbard, to the twisting high notes of Maynard Ferguson, his riffs jabbing playfully at the intersecting grooves, short bursts of notes riding the swells and washes of drum and bass foundations and the kinetic activity of the trumpet and trombone (also played by Gollehon) to provide bursts, blasts, melodic outlines and searing ostinato pointillism. Gollehon alternates between staccato, where each sharp note is distinct from the other, and legato, a smoother, more flowing approach to the scales. 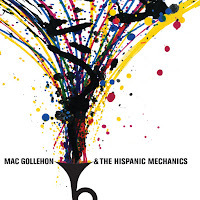 The band, especially in the crazy activity of bassist Mike Griot and percussionists Miguel Valdez, Baba Don, Ronnie Roc establish a tight, pulsating weave of beats and vibes, accelerated and toned down as mood requires, a superb canvas of commotion for Gollehon to work his magic upon. My one complaint, if you could call it that, is the lack of any extended solos from the trumpeter. An artist who’s been widely praised for his skill to ad lib compelling solos that precisely fits the musical frame work he’s working in, a hot-footed sortie, an lyrical chorus or three of sublimely timed notes, riding the crest of these rich waves of sound, would have been the icing on the cake.Though jazzy in a large measure, this isn’t a jazz record but rather one intended to get the listener to arise and dance in the middle of whatever room they happened to be sitting, to sing along even though they might not speak Spanish, this is music meant to put the listener in the center of his or her being, in the present tense, past and future banished for the time being, so the syncopated joy can commence and rule the hour. This is Mac Gollehon and the Hispanic Mechanic’s gift to you.